It’s been 11 long years since UK pop/soul singer-songwriter Gabrielle released a new album, 2007’s under-rated Always. Since then we’ve had a 2-disc greatest hits collection Now and Always: 20 Years of Dreaming, which spawned the single Say Goodbye. 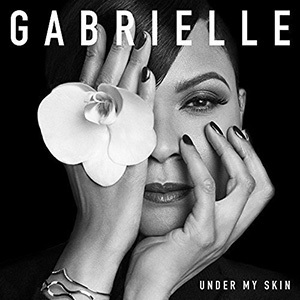 Thankfully the wait for new music is over as Gabrielle has released her sixth studio album Under My Skin following the warm reception to new tracks Show Me and Shine. The release also coincides with her 25th year in the music industry. Earlier this year Gabrielle announced her return to releasing music, unveiling new single Show Me. That track perfectly captures Gabrielle’s ability to perfectly balance pop with soul, and it ranks amongst her finest songs to date. Her husky yet soulful voice takes centre stage and the song is an uplifting romantic track that hits her core fanbase in the sweet spot. When I spoke to Gabrielle around the release of Show Me, she teased that her new album would be positive and hopeful, and she wasn’t wrong. Opening with the gorgeous groove of the title track Under My Skin, the album quickly shows its hand. This is the Gabrielle we know and love, doing what she does best but with a contemporary edge. All of the ingredients that have ensured Gabrielle has a long and successful career are present here. She’s not chasing chart positions or trying to keep up with the latest trends. Instead she’s making music that’s true to her as an artist and that rings loud and clear throughout Under My Skin. The Motown feel of Thank You is a joyous ode to being grateful to a loved one for their unconditional support, Stronger is an inspirational moment that compels the listener to find the light at the end of an oft dark tunnel, and Young and Crazy is a breezy pop gem about living life to the full. The empowerment theme that runs through much of the record is at its most powerful on the stunning Won’t Back Down, a defiant song that showcases one of Gabrielle’s best vocals on the record. The strongest moment on the record is Every Step. The song opens with luscious strings before opening up into a soaring anthem that encourages the listener to feel confident with every foot they put forward in life. It’s uplifting, it’s positive and it’s a much-needed message right now. Elsewhere on the record the beat-driven Put Up a Fight is one of the more uptempo moments, Signs combines a slow soulful groove with an emotive vocal from Gabrielle, and closing track Shine is a rousing end to a powerful and moving record. I hadn’t realised how much I’d missed Gabrielle’s voice until I heard Under My Skin. The record is a showcase of one of the UK’s greatest, and under-appreciated, musical talents. No one can sing a song like Gabrielle can and with Under My Skin she continues to operate in her own lane. This is a bold, optimistic and hopeful record that is her best material since 1999 album Rise.